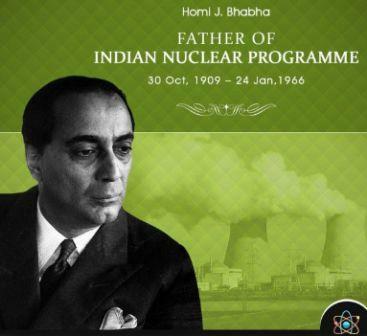 Homi Jehangir Bhabha (30 October 1909 – 24 January 1966) was an Indian nuclear physicist, founding director, and professor of physics at the Tata Institute of Fundamental Research (TIFR).Colloquially known as "father of the Indian nuclear programme",Bhabha was also the founding director of the Atomic Energy Establishment, Trombay (AEET) which is now named the Bhabha Atomic Research Centre in his honor. TIFR and AEET were the cornerstone of Indian development of nuclear weapons which Bhabha also supervised as director. Homi Jehangir Bhabha was born into a wealthy and prominent industrial family, through which he was related to businessmen Dinshaw Maneckji Petit, and Dorabji Tata. He was born on 30 October 1909, in an illustrious family with a long tradition of learning and service to the country. His father was Jehangir Hormusji Bhabha, a well known Parsi lawyer and his mother was Meheren.He received his early studies at Bombay's Cathedral and John Connon School and entered Elphinstone College at age 15 after passing his Senior Cambridge Examination with Honors.He then attended the Royal Institute of Science in 1927 before joining Caius College of Cambridge University. Bhabha's father understood his son's predicament, and he agreed to finance his studies in mathematics provided that he obtain first class on his Mechanical Sciences Tripos exam. Bhabha took the Tripos exam in June 1930 and passed with first class. Afterwards, he excelled in his mathematical studies under Paul Dirac to complete the Mathematics Tripos. Meanwhile, he worked at the Cavendish Laboratory while working towards his doctorate in theoretical physics. During the 1931–1932 academic year, Bhabha was awarded the Salomons Studentship in Engineering. In 1932, he obtained first class on his Mathematical Tripos and was awarded the Rouse Ball traveling studentship in mathematics. During this time, nuclear physics was attracting the greatest minds and it was one of the most significantly emerging fields as compared to theoretical physics, the opposition towards theoretical physics attacked the field because it was lenient towards theories rather than proving natural phenomenon through experiments. Conducting experiments on particles which also released enormous amounts of radiation, was a lifelong passion of Bhabha, and his leading edge research and experiments brought great laurels to Indian physicists who particularly switched their fields to nuclear physics, one of the most notable being Piara Singh Gill. In January 1933, Bhabha received his doctorate in nuclear physics after publishing his first scientific paper, "The Absorption of Cosmic radiation".The paper helped him win the Isaac Newton Studentship in 1934, which he held for the next three years. The following year, he completed his doctoral studies in theoretical physics under Ralph H. Fowler. In 1935, Bhabha published a paper in the Proceedings of the Royal Society, Series A, in which he performed the first calculation to determine the cross section of electron-positron scattering. Electron-positron scattering was later named Bhabha scattering, in honor of his contributions in the field. In 1936, with Walter Heitler, he co-authored a paper, "The Passage of Fast Electrons and the Theory of Cosmic Showers"in the Proceedings of the Royal Society, Series A, in which they used their theory to describe how primary cosmic rays from outer space interact with the upper atmosphere to produce particles observed at the ground level. Bhabha and Heitler then made numerical estimates of the number of electrons in the cascade process at different altitudes for different electron initiation energies.In 1937, Bhabha was awarded the Senior Studentship of the 1851 exhibition, which helped him continue his work at Cambridge until the outbreak of World War II in 1939. In September 1939, Bhabha was in India for a brief holiday when World War II started, and he decided not to return to England for the time being. He accepted an offer to serve as the Reader in the Physics Department of the Indian Institute of Science.He received a special research grant from the Sir Dorab Tata Trust, which he used to establish the Cosmic Ray Research Unit at the Institute. Bhabha selected a few students, including Harish-Chandra, to work with him.Later, on 20 March 1941, he was elected a Fellow of the Royal Society. With the help of J. R. D. Tata, he played an instrumental role in the establishment of the Tata Institute of Fundamental Research in Mumbai. After his death, the Atomic Energy Establishment at Bombay was renamed as the Bhabha Atomic Research Centre in his honour. In addition to being an able scientist and administrator, Bhabha was also a painter and a classical music and opera enthusiast, besides being an amateur botanist.He is one of the most prominent scientists that India has ever had. Bhabha also encouraged research in electronics, space science, radio astronomy and microbiology. The famed radio telescope at Ooty, India was his initiative, and it became a reality in 1970. The Homi Bhabha Fellowship Council has been giving the Homi Bhabha Fellowships since 1967 Other noted institutions in his name are the Homi Bhabha National Institute, an Indian deemed university and the Homi Bhabha Centre for Science Education, Mumbai, India.